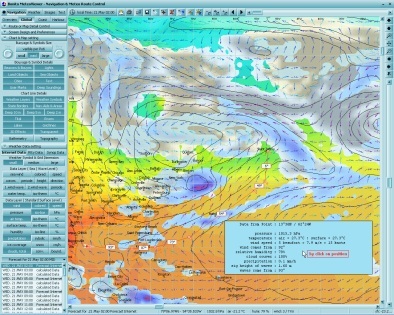 The MeteoViewer uses the data that are received with with the MeteoCom. 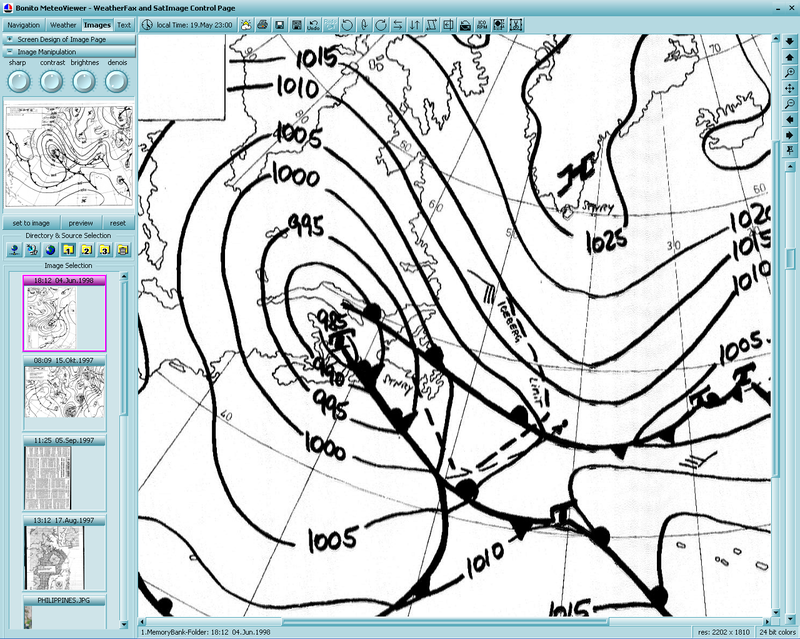 This program is free and is given as an example for the MeteoTools, a Program-Library for the preparation of the meteo data (Software developer can find more on the Developer-Plattform). 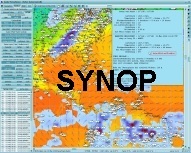 Here the data is processed that was downloaded from the internet with the MeteoServer or as synop data from the radio. All possible displays of the parameters can be combined. Remarkable is the smooth flowing of the resolution of the data-grid-points for example the spacing between the single wind arrows. Zooming down to the planks of the harbour is metrological nonsense because zooming does not heighten the resolution because nobody in the world can make such a calculation that is better than a meteo computer centre not even the largest computer can do this, so why do people believe in the stupid talk of some data producers that say they can do it better, in any case Bonito can not do this either, so always use the visualisation large enough so you can what could come from where to your location. Further zooming on to a point will only bring exacter details. The metrological fault rate is so large that for example an exacter position of a rain border over a certain position is proportional to the fault rate. 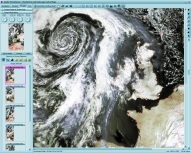 The MeteoViewer only shows this in a better resolution so does not do any metrological fortune telling. Although the internal calculator takes into consideration certain topographic facts only the scientific consequences are followed for example a wind cannot blow through a hill even if the wind arrows show this phenomenal the worth’s are shown as they would have been theoretically if every thing had been flat. 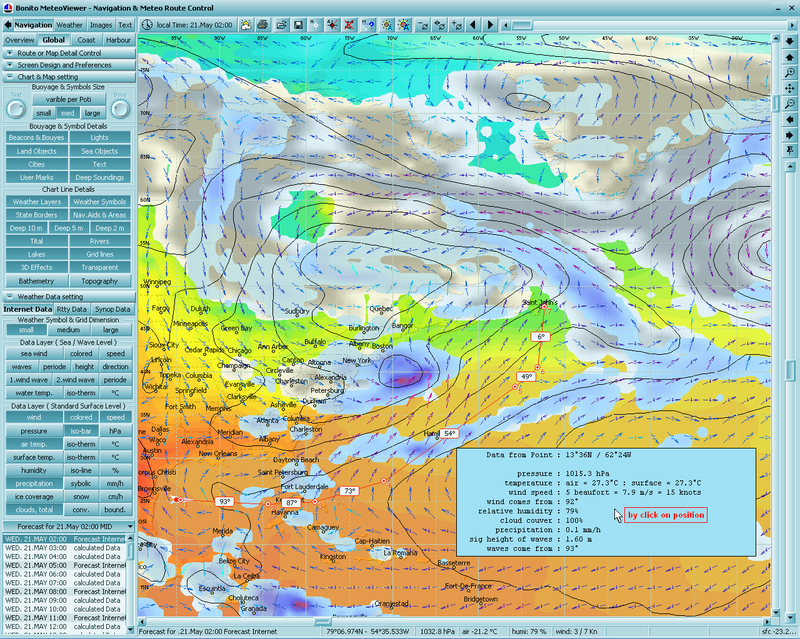 This might be of importance to Para gliders but I hope that the spippers do not want to sail in the hills because the MeteoViewer is made especially for the marine. 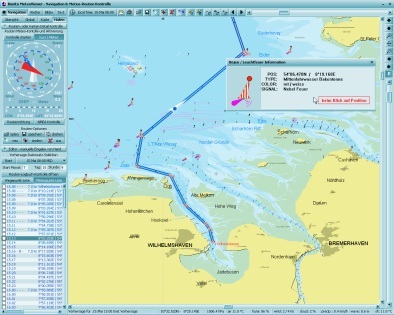 Wave height and direction Waves are displayed as a coloured line for the marking of the danger zones. can be coloured for marking the danger zone. also displayed as a line, Isotherm. Humidity also displayed as a line. as a symbol like rain, hale, thunderstorm, snow. Clouds, convective and / or boundary. The most exciting is the animation. The future weather is displayed as a film on your screen. While you can change the display by zooming or shifting. This way you can see what is coming and if you are going to have a good time or a bad time and are better off staying in port. 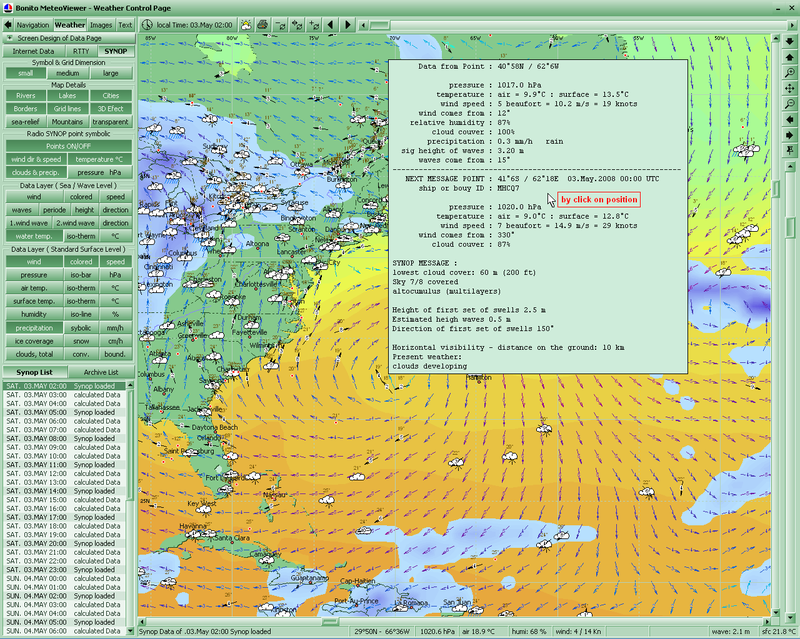 This is a complete sea chart program, with all usual details and functions, which are updated over Internet (like the weather). 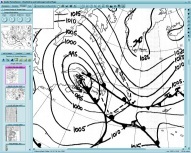 A world novelty is however meteorological route control. You see a colored route, which is colored by the weather over the way time on the map. Thus can be recognized fast and clearly, when to which time, which route section makes problems - or also not. 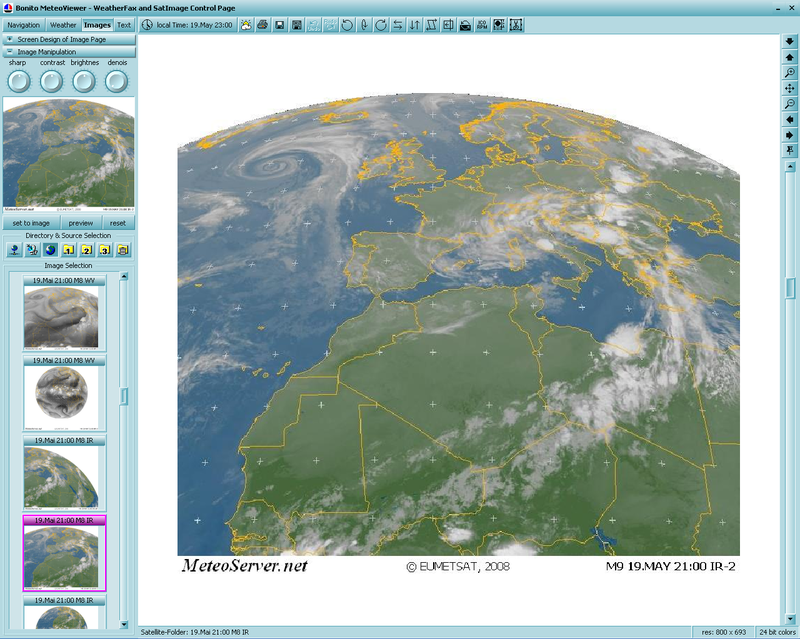 Here you can look at the pictures or process them, that where loaded from the internet via MeteoServer or by weather fax from a radio. The use is self explanatory. There is a special section for series satellite pictures that can be used for an animation. The most exciting is the animation. The future weather is displayed as a film on your screen. While you can change the display by zooming or shifting. Most noticeable is the special type off animation. A special image transformation makes it possible for a brilliant display off the slide show. This has up to now never been achieved. 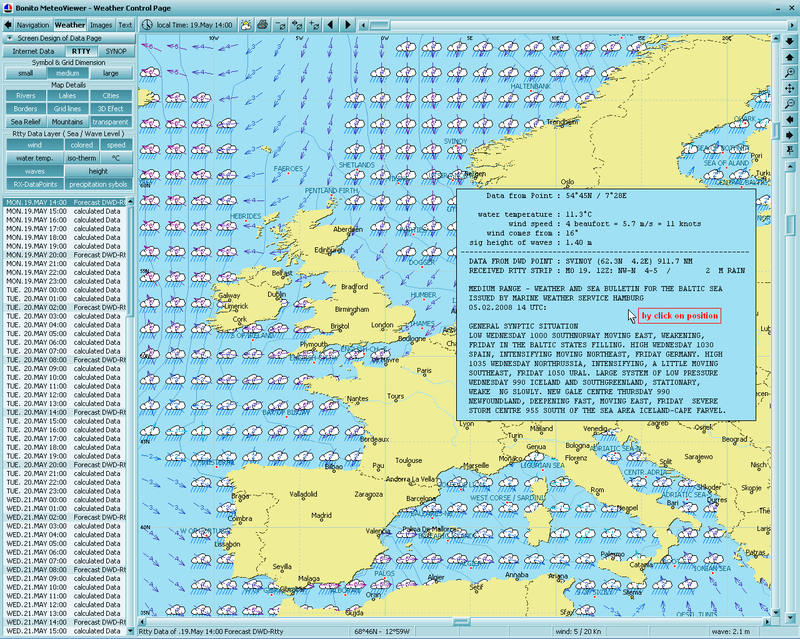 Text such as weather reports and are normally received by radio sorted and placed in the appropriate folders, so that you do not have to look through all messages to find a certain Atlantic report these text can come from Navtex or RTTY. They are normally called Telex Teletype or RTTY. 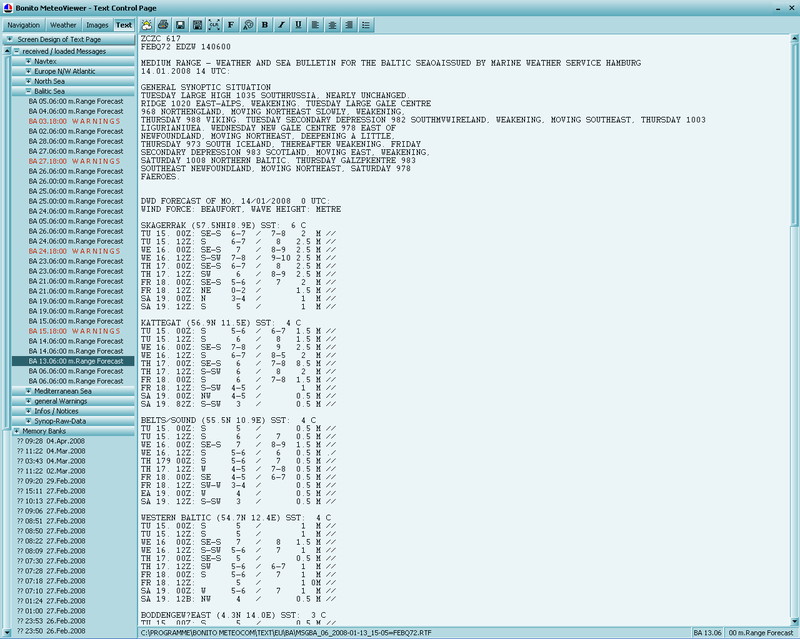 Navtex is a special Telex type that is received every 4 hours and warns about navigation problems or send weather reports. Additionally some text is decoded and transfered into a world map.